The compute tier on which the project runs, which can be the free tier or an Azure virtual machine. Project metadata, which includes a name, description, an identifier that's used when sharing the project, and whether the project is public or private. The project's notebook, data, and other files, which you manage like any other file system. A project's environment, which you manage either through startup scripts or directly through the terminal. Logs, which you access through the terminal. The management and configuration features described here are available only to the project owner who created the project initially. You can, however, clone the project into your own account, in which case you become the owner and can configure the project as desired. Azure Notebooks starts the underlying virtual machine whenever you run a notebook or other file. The server automatically saves files and shuts down after 60 minutes of inactivity. You can also stop the server at any time with the Shutdown command (keyboard shortcut: h). You can bypass these limitations by using a different virtual machine that you've provisioned in an Azure subscription. You must install and run JupyterHub on that virtual machine. The Data Science Virtual Machine images (any operating system) are good choices because they include JupyterHub by default. You're signed into Azure Notebooks with an account that uses Azure Active Directory (AAD), such as a company account. Your account is connected to an Azure subscription. 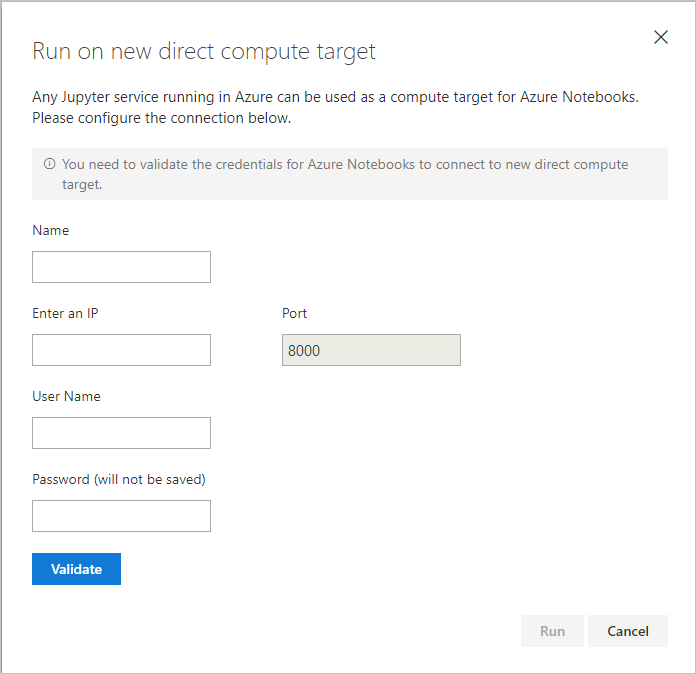 When you select a DSVM instance, Azure Notebooks may prompt you for the specific machine credentials used when you created the VM. To create a new DSVM instance, follow the instructions on Create an Ubuntu Data Science VM. 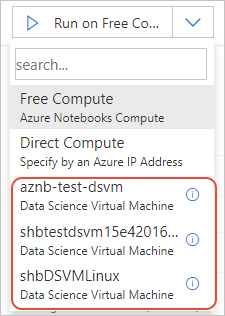 Use the Data Science Virtual Machine for Linux (Ubuntu) image if you want the DSVM to appear in the drop-down list in Azure Notebooks. If for other reasons you need to use the Windows or CentOS image, you can use the Direct Compute option to connect to the DSVM manually. When using Direct Compute or Data Science virtual machines, the notebooks you run on them must be entirely self-contained. At present, Azure Notebooks copies only the .ipynb file to the VM but doesn't copy any other files in the project. As a result, notebooks running on other VMs fail to find other project files. Copy project files manually to the VM. 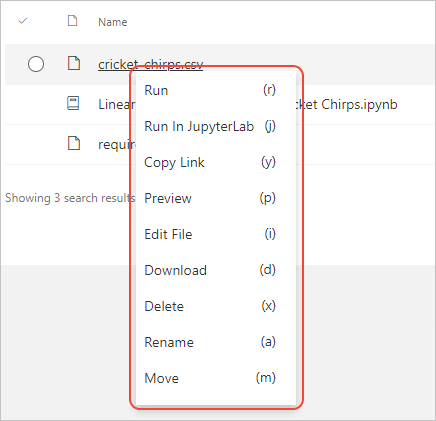 Embed the files within a setup notebook that you run first before the primary notebook. In the setup notebook, create a code cell for each file where the cell contains the file contents. Then at the top of each cell, insert the command %%writefile <filename>, where <filename> is the name of the file to receive the contents. When you run the notebook, it creates all those files on the VM. For an example, see the setup.ipynb file in the Microsoft Pet Detector demo (GitHub). On the project dashboard, select Project Settings, then select the Information tab, which contains the project's metadata as described in the following table. You can change project metadata at any time. Project name A friendly name for your project that Azure Notebooks uses for display purposes. For example, "Hello World in Python". Project ID A custom identifier that becomes part of the URL you use to share a project. This ID can use only letters, numbers, and hyphens, is limited to 30 characters, and cannot be a reserved project ID. If you're unsure what to use, a common convention is to use a lowercase version of your project name where spaces are turned into hyphens, such as "my-notebook-project" (truncated if necessary to fit the length limit). Public project If set, allows anyone with the link to access the project. When creating a private project, clear this option. Hide clones If set, other users can't see a list of clones that have been made for this project. Hiding clones is useful for projects that are shared with many people who are not part of the same organization, such as when using a notebook for teaching a class. Changing the project ID invalidates any links to the project that you might have shared previously. The project dashboard shows the contents of the project's folder system. You can use various commands to manage those files. Notebook A Jupyter notebook Displays a popup in which you specify the notebook's filename and language. Folder A subfolder Creates an edit field in the project's file list into which you enter the folder name. Blank File A file into which you can store any content such as text, data, etc. Creates an edit field in the project's file list into which you enter the file name. Markdown A Markdown file. Creates an edit field in the project's file list into which you enter the file name. The Upload command provides two options to import data from other locations: From URL and From Computer. 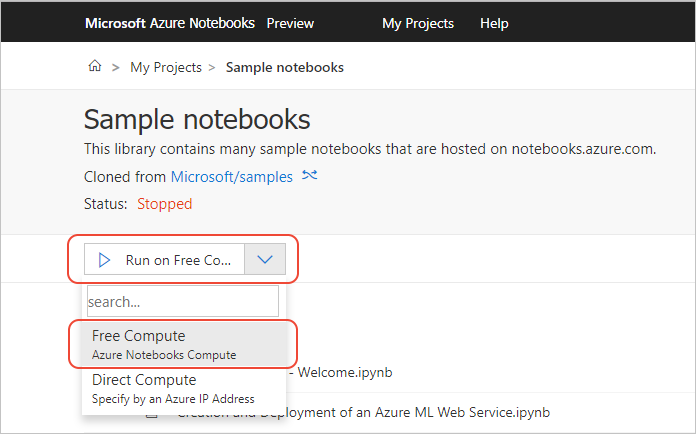 For more information, see Work with data files in Azure Notebook projects. Run r (or click) Runs a notebook file. Other file types are opened for viewing. Copy Link y Copies a link to the file to the clipboard. Run in Jupyter Lab j Runs a notebook in JupyterLab, which is a more developer-oriented interface than Jupyter normally provides. Preview p Opens an HTML preview of the file; for notebooks, the preview is a read-only rendering of the notebook. For more information, see the Preview section. Edit file i Opens the file for editing. Download d Downloads a zip file that contains the file or the contents of a folder. Rename a Prompts for a new name for the file or folder. Delete x Prompts for confirmation, then permanently removes the file from the project. Deletions cannot be undone. Move m Moves a file into a different folder in the same project. A preview of a file or notebook is a read-only view of the contents; running notebook cells is disabled. A preview is shown to anyone that has a link to the file or notebook but has not signed into Azure Notebooks. Once signed in, a user can clone the notebook to their own account, or they can download the notebook to their local computer. Share s Displays the sharing popup from which you can obtain a link, share to social media, obtain HTML for embedding, and send an email. Clone c Clone the notebook to your account. Run r Runs the notebook if you're allowed to do so. Download d Downloads a copy of the notebook. Access the virtual machine through a terminal. All forms of project configuration are applied whenever the virtual machine is started, and thus affects all notebooks within the project. The first-time Azure Notebooks creates a server for the project, it looks for a file in the project called aznbsetup.sh. If this file is present, Azure Notebooks runs it. The output of the script is stored in your project folder as .aznbsetup.log. You can use the project's environment settings to create individual steps that configure the environment. Requirements.txt: In the second drop-down list, select a requirements.txt file that's already in the project. Then select a Python version from the third drop-down list that appears. By using a requirements.txt file, Azure Notebooks runs pip install -r with the requirements.txt file when starting a notebook server. You don't need to explicitly install packages from within the notebook itself. Shell script: In the second drop-down list, select a bash shell script in the project (typically a file with the .sh extension) that contains any commands you wish to run to initialize the environment. Environment.yml: In the second drop-down list, select an environments.yml file for Python projects using a conda environment. When you're done adding steps, select Save. On the project dashboard, the Terminal command opens a Linux terminal that gives you direct access to the server. Within the terminal you can download data, edit or manage files, inspect processes, and even use tools like vi and nano. If you have startup scripts in your project's environment, opening the terminal may display a message indicating that setup is still in progress. To affect a specific environment, change directories into that environment folder first. Changes made to the server apply only to the current session, except for files and folders you create in the project folder itself. For example, editing a file in the project folder is persisted between sessions, but packages with pip install are not. If you use python or python3, you invoke the system-installed versions of Python, which are not used for notebooks. You don't have permissions for operations like pip install either, so be sure to use the version-specific aliases. If you run into issues when running a notebook, output from Jupyter is stored in a folder named .nb.log. You can access these logs through the Terminal command or the project dashboard. Typically when you're running Jupyter locally you may have started it from a terminal window. The terminal window shows output such as kernel status.